This devastating Greensburg tornado was an F5 tornado, rarely seen, and not previously experienced in Kansas for decades. This tornado was four miles wide at touch down and it devastated 95 percent of Greenburg. 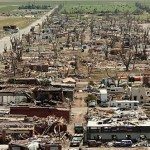 The first EF-5 tornado in the United States since 1999 destroyed the town of Greensburg in southwest Kansas May 4, 2007, as part of a major, weekend outbreak of severe weather and flooding in the Central Plains, according to NOAA National Weather Service reports. Greensburg was evacuated after the tornado, and the town remains closed except to residents and emergency workers. A spokesman for the Kansas Department of Transportation office in Pratt said routing U.S. Highway 54 traffic around Greensburg is likely to continue for a week. The detour totals about eighty-five miles. The National Weather Service confirmed that the twister that hit Greensburg on Friday at about 9:45 P.M. was an F5, the highest on the scale. With winds of 205 mph, it stayed on the ground about an hour, traveling for twenty-two miles and wreaking a path of destruction nearly two miles wide. Ninety-five percent of the town was wiped out. NOAA forecasters in Dodge City were able to issue a Tornado Warning thirty-nine minutes before the 1.7-mile-wide wedge tornado hit the town. Noting intensification in radar images and a bearing directly toward Greensburg, Dodge City weather staff updated with a Tornado Emergency message 10–12 minutes before the twister hit. NOAA confirmed that the twister was an EF5 with wind speeds of about 205 mph. A broad area of low pressure moving slowly from the west encountered a warm front extending from western Nebraska into the Oklahoma and Texas Panhandles. Fed by copious amounts of moisture from the Gulf of Mexico, the collision spawned an active period of severe weather. Since Friday, May 4, the NOAA Storm Prediction Center in Norman, Okla., received 136 tornado reports, 109 reports of high winds and 429 reports of large hail, mostly concentrated on the plains. Greensburg, like much of Kansas, is familiar with severe tornadoes but it has been many years since anything approaching the severity of the 2007 tornado occurred. Perhaps it is because of the state’s history that it was selected as the imaginary setting for the famous Judy Garland movie “The Wizard of Oz.” Greensburg is located in the southwest part of the state and about fifty miles north of the Oklahoma border. It is a town of about 1500 people and, for such a place, the loss of nine lives from this tornado was a severe blow. Two additional deaths occurred nearby. The Federal government immediately declared Greensburg a disaster scene, meaning that there would be federal financial assistance for the stricken town. President Bush visited the scene within a few days of the event. NOAA, an agency of the U.S. Commerce Department, is celebrating two hundred years of science and service to the nation. From the establishment of the Survey of the Coast in 1807 by Thomas Jefferson to the formation of the Weather Bureau and the Commission of Fish and Fisheries in the 1870s, much of America’s scientific heritage is rooted in NOAA. NOAA is dedicated to enhancing economic security and national safety through predicting and conducting research into weather and climate- related events, providing and delivering an information service for transportation, and by providing environmental stewardship of the nation’s coastal and marine resources. Through the emerging Global Earth Observation System of Systems (GEOSS), NOAA is working with its federal partners, more than sixty countries and the European Commission to develop a global monitoring network that is as integrated as the planet it observes, predicts and protects.